First of all: All the participants (see above for the group that was still there on Saturday afternoon) and the speakers. Special thanks to Frank Karlitschek and Michael Kromer for filling two Saturday slots last minute. 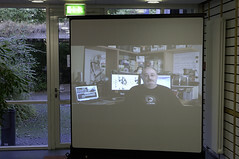 The first person to show up in the morning and the last one in the evening was Michael LÃ¶ffler. 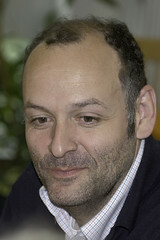 He also did a great job in preparing the conference which included organizing the venue and getting our sponsors on board. The program committee did a great job of selecting talks and tracks for good program under the motto “Collaboration about borders”. Thanks to Andrew, Cornelius, Gnokii, Jan, Jos, Klaas, Michl, and Vincent. Jacqueline run the reception – together with the Novell apprentices including Nanuk Krinner, Michael HÃ¤ffner, Jan LÃ¶ser, Benjamin Brunner and Max Maier. Anne drove the mini bus to the tram in the mornings and evenings to make it easy for those not staying at the conference venue to come to it. Tom and the boosters organized the party called Lizard lounge. 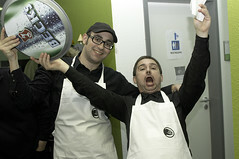 It was a surprise to see the boosters as friendly waiters, like Will and Egbert above. 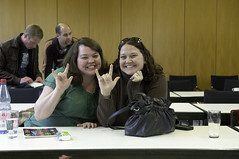 Jamie and Christine interpreted to American sign language so that Bryen could fully participate in the conference. 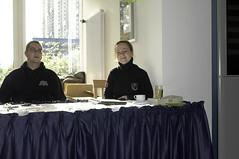 Vera Schneider, Brigitte Haas and Hannah Roericht organized the press participation and interviews. Alexia did some preparation of the conference remotely from the US. Thanks to our worldwide ambassadors that send greetings our way! Also, a special thanks to our sponsors without whom this conference would not have been possible at all: Novell as main sponsor, B1 Systems sponsored the party, open-slx took care of the shuttle service, Nokia/Qt supported us with some â‚¬ and Linux Magazin as media partner. Last but not least, a big thanks to the friendly staff from the BerufsfÃ¶rderungswerk. Not only for me the conference was really great.Â The atmosphere was cheerful and besides the presentations and BoFs, there were a lot of discussions happening. 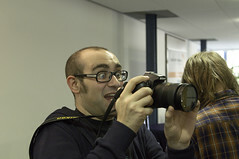 You can see more photos in the osc10 flickr group. Please send us feedback to cfp@opensuse.org on what went well or not so well at the conference so that we can make next year again another great openSUSE conference. 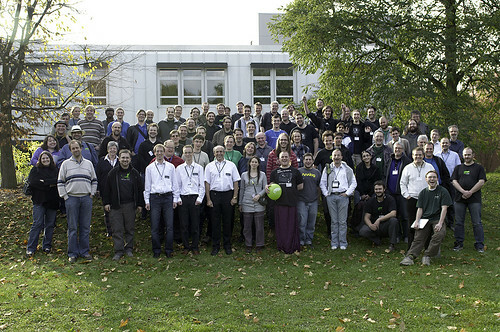 « openSUSE Weekly News, Issue 146 is out! I have to admit, seeing the “R.I.P” over the openSUSE conference announcement made me think it was canceled, never to be held again. However I’m glad it was a success. Over in the US I coouldn’t attend, but I enjoy reading and viewing what’s reported.